The perfect card to stall out Sapphiron. I fooled around with a few decks to beat Heroic Sapphiron with in Hearthstone. I beat the Normal Mode version of Sapphiron with a simple Warrior deck. The Heroic challenge is obviously much more difficult because none of your minions will last longer than one turn. I experimented with Warrior at first to beat the Heroic version, but found I just didn’t have the cards for it. To beat Sapphiron on Heroic you need the perfect control Warrior deck with Shield Slams, Execute, Gorehowls, and Brawls. I just don’t have all those cards and they’re too expensive to craft. I do have almost all the Mage cards though! 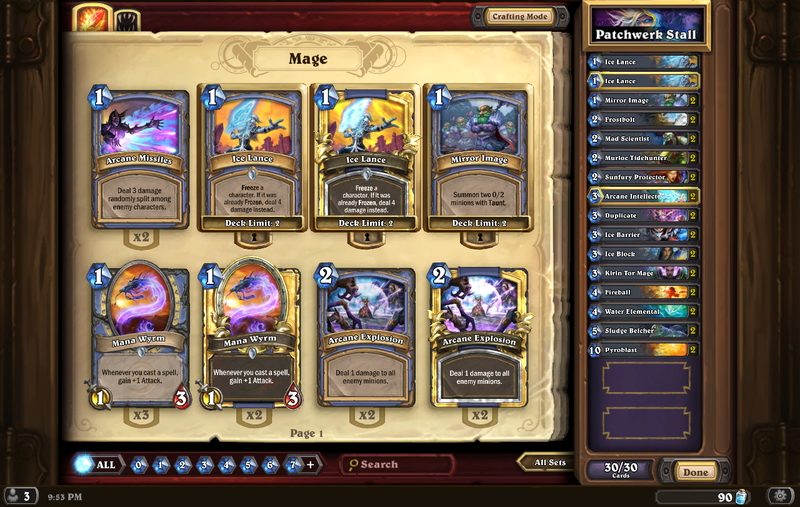 Here’s the Mage deck I used to pummel Heroic Sapphiron into the dust. 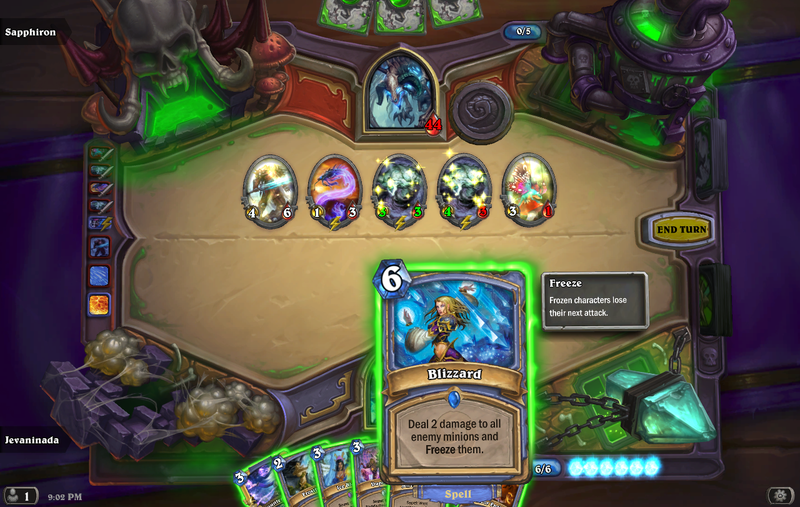 The strategy is very similar to a freeze Mage deck. Stall the opponent out until they’ve run out of stuff. With the perfect draw it’ll work to prevent Sapphiron from killing you. Counterspell is very useful for getting rid of Sapphiron’s Pure Cold spell. Mirror Entity will often soak up a Frostbolt if it doesn’t let you trade for a creature. But how do you kill Sapphiron? The first bit of damage should come from your hero power. Use it on her whenever you can afford to. The second bit comes from any left over Fireballs or Frostbolts you have after Sapphiron has played through her entire deck (You’ll have one if you’re lucky). Most of the damage comes from the Pyroblasts and the combination of Feugen and Stalagg. Feugen and Stalagg don’t do much on their own against Sapphiron. She’ll just destroy them same as any other minion at the start of her turn. But because they die on her turn, Thaddius is also summoned on her turn. Then when your turn rolls around you can attack with Thaddius for a big pile of damage. In a pinch Thaddius can also take out a minion. But two Pyroblasts and one Thaddius is only 31 damage. Where’s the other 14 coming from? Hopefully from the latest Mage additions in Naxxramas, the Duplicate secret. The Duplicates should be played when Feugen or Stalagg are about to die. When the little golems die, you can play them again to summon their big brother once more. If you play the Duplicates for Thaddius, then you can still play him. Unfortunately, Sapphiron will destroy him before he gets the chance to do anything. The same thing goes for combining Duplicate with Mirror Entity, so watch out for that as well. The deck may not work on the first try, but I can assure you that it does work. Give it a try if you’ve got the cards! My Mage deck for taking down Heroic Patchwerk. I did a Twitch stream on August 15th of the new Construct Quarter in Naxxramas. The stream will be available for a limited time on the GoCorral channel at Twitch if you want to watch. I wasn’t able to finish all the bosses and class challenges this time. Mostly because the class challenges weren’t knock over easy anymore. I tried about a half dozen times on the Warrior challenge and had to end the stream defeated. 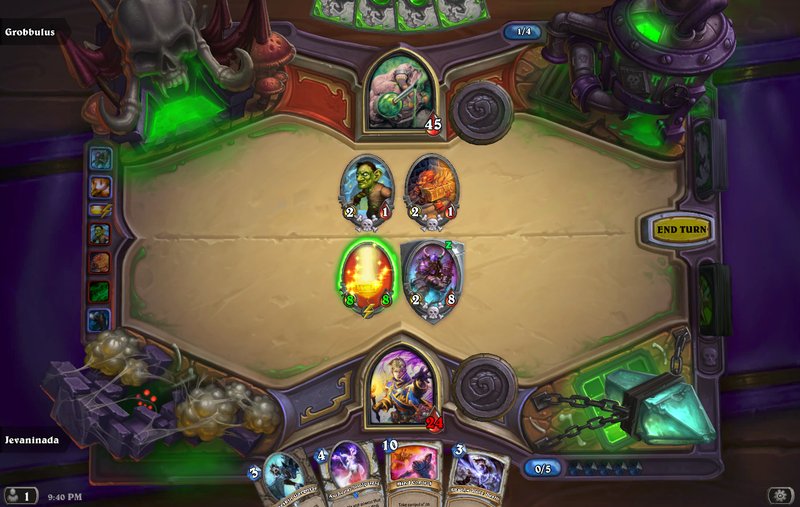 Later on I took a crack at the Heroic bosses and I took down Patchwerk on my first try with the deck pictured above. Patchwerk is the most unusual Naxxramas boss so far. He doesn’t have a deck. All Patchwerk has is a weapon that he starts with and his hero power. Patchwerk’s weapon, Hook, has a deathrattle effect that puts it back in his hand so he can play it again. His hero power costs 4 and destroys one minion of Patchwerk’s choice. He’ll always pick a taunt minion or your strongest minion. Patchwerk’s turn is easy to predict. If his Hook is in his hand he’ll play it. Next he uses his hero power if he has enough mana to do so to destroy the largest taunt minion you have or if there are no taunt minions, your largest minion without taunt. Finally, Patchwerk attacks your taunt minions or your face. The only difference between the Normal and Heroic version of Patchwerk is the Hook. The Normal Hook has 5 attack and 8 durability. 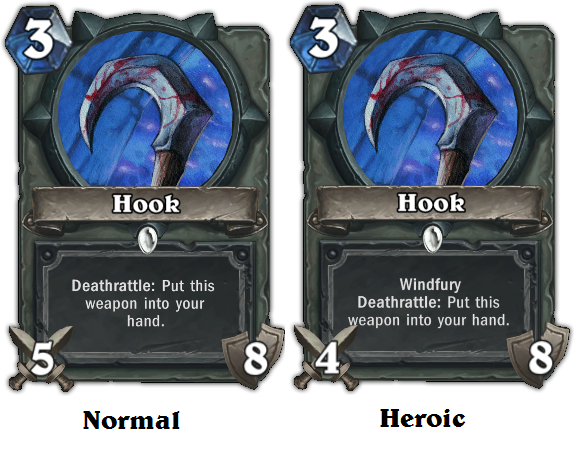 The Heroic Hook has 4 attack, 8 durability, and windfury so he can attack twice per turn. So fiendish! So devilish! The Hook of Patchwerk! A game against Patchwerk won’t take very long because his strategy focuses on hitting you in the face instead of clearing the board. The deck I made is focused around freezing Patchwerk or stalling him with weak minions. I won my first game against him by playing Mirror Image early, and then a Kirin Tor Mage to get a Duplicate secret down as well. Patchwerk wiped out the Mirror Images, but the Duplicate put two more of them in my hand to stall him even further. I used my Sunfury Protector, Murloc Tidehunter, and Sludge Belcher to stall further with other cheap taunt creatures while my Kirin Tor Mage hit Patchwerk for damage every turn. Patchwerk hurt himself by using his Hook to take out my minions, but he was never smart enough to use his hero power to destroy the Kirin Tor Mage that was slowly murdering him. I played two Ice Blocks to stall further and I had an Ice Barrier in hand to last another turn as well. Another strategy of the deck is to get a Water Elemental down along with some taunts. The Water Elemental will keep Patchwerk frozen and unable to attack while the taunts will soak up the hero power instead of the Water Elemental. If you get that strategy going, you’re guaranteed a win. Taking out the Pyroblasts. The game ended on turn 9. Usually you won’t get a chance to use one. Taking out Arcane Intellect maybe? Maybe adding cards like Dancing Swords and Coldlight Oracle to force Patchwerk to draw and hurt himself with fatigue damage. I hope that helps you take down Patchwerk! I’ll be working on other decks to beat other Heroic bosses in the Construct Quarter soon. I’ve been messing around with the Heroic bosses on Naxxramas and they are pretty hard! Fortunately, I’ve started to learn a few tricks to beat them. Initially I was looking up decks on the internet to try and get past them, but I just beat all of the Military Quarter using my own creations. A part of me feels like looking up decks to win was cheating, like looking up the answer to a riddle. So I think I’ll try beating them on my own in the future. For those of you who don’t share the same compulsion, here’s the basic outline of a few decks that will help. I’ve only needed four decks to beat the Heroic bosses so far. The deck I use most often is a Divine Spirit and Inner Fire combo Priest deck. The deck works by plopping down a minion with lots of health, like the Stone Gargoyle I used in the video. Use Power Word: Shield and Divine Spirit to increase that minion’s health and then turn it into an unstoppable monster by using Inner Fire. So far this deck or slight variations on it have worked for Heroic Anub’Rekhan, Faerlina, Noth, Heigan, Razuvious, and Baron Rivendare. Make modifications for those battles based on what cards you have and what your own experience with the bosses. I’m sure you can quickly modify the deck to win against any of the Heroic bosses. 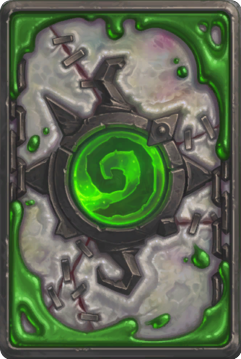 The bosses that required special decks were Maexxna, Loatheb, and Gothik. I already detailed a proposed Maexxna deck in a previous post. That deck ended up working. Load up a Paladin deck with as many battlecries and heals as you can. The objective is to fill Maexxna’s side of the board with 7 minions all only having 1 attack. Humility and Aldor Peacekeeper both help greatly with this for when she plays her Giant. Voodoo Doctor, Earthen Ring Farseer, Lightbringer, and Holy Light will all help keep your health at a good level. The game winning combo is Guardian of Kings and either a Wolfrider or an Arcane Golem if you have one. Play the Guardian of Kings every turn to restore 6 life and then play Wolfrider or Arcane Golem to charge at Maexxna and deal her 3 or 4 damage. Maexxna will bounce the Guardian and your charge minion back to your hand and then attack with all 7 of her minions to deal you 7 damage. Then you repeat! Each turn you’re only taking an effective 1 damage while she takes 3 or 4. If your health gets dangerously low you can play a Guardian and a Voodoo Doctor or Earthen Ring Farseer to gain a little health past what her 7 minions can deal you. 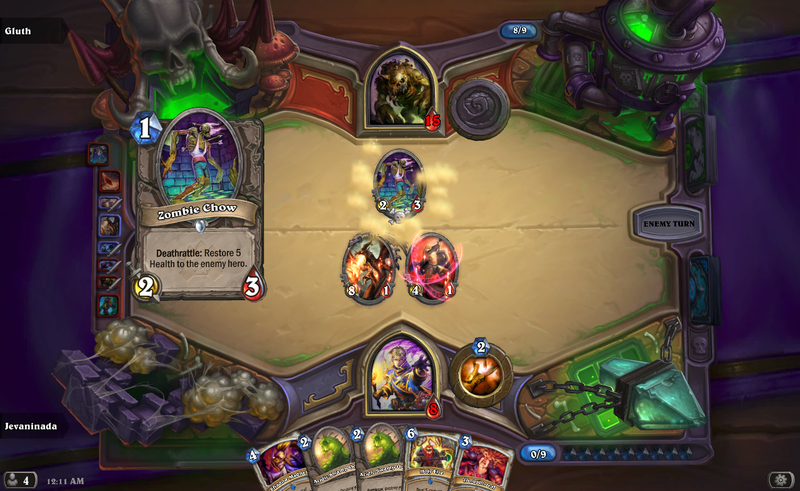 I beat Loatheb using a heavily modified version of the Divine Spirit/Inner Fire Priest deck. Shadow Word: Pain is pretty much the only card that can remove Loatheb’s starting Fen Creeper before it deals you too much damage. The Priest provides heals with the hero power and Lightwells to mitigate Loatheb’s hero power damage. 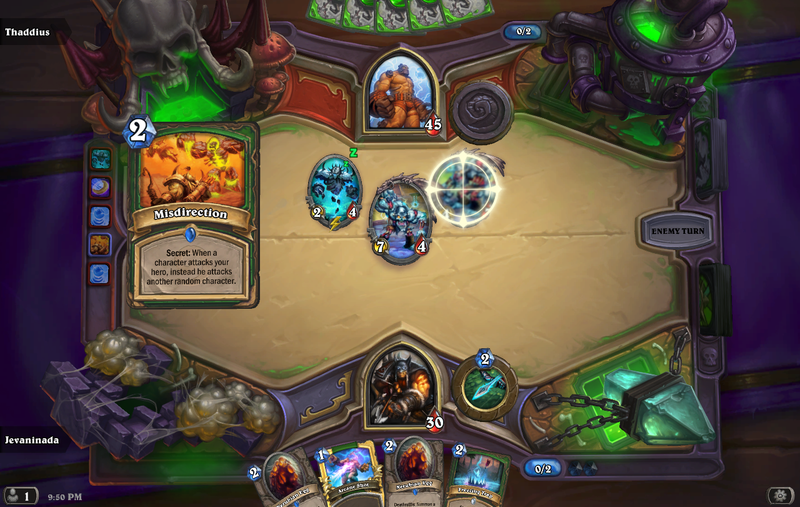 The additional cards needed are Elven Archers, Ironforge Riflemen, and Holy Smites to take out the spores. It’s best to get the spore bonus on as many minions as possible so the addition of Haunted Creepers, Murloc Tidecallers, or Razorfen Hunters is a good idea. The plan is to outlast Gothik until he has drawn his entire deck. Kill the smaller of his minions and then turn them into taunts with Marks, Sunfury, or a Defender of Argus if you have them. Naturalize should be saved for Gothik’s bigger minions. 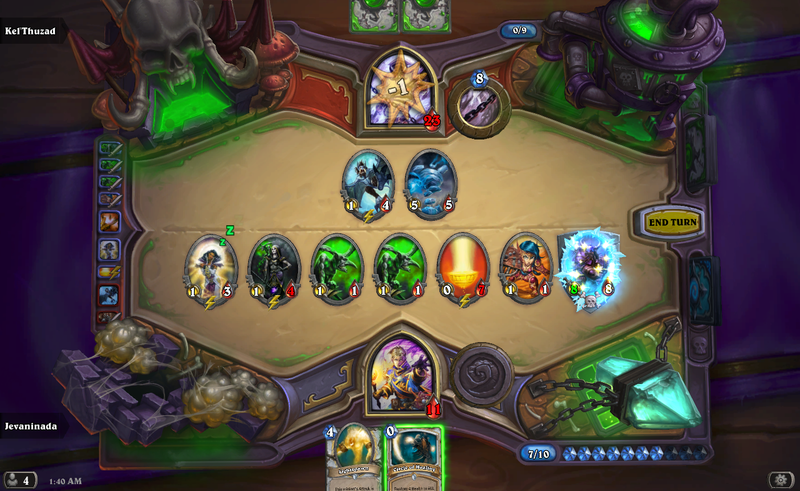 Savage Roar is another good way to get rid of the Spectral minions Gothik gives you. Poison Seeds is also great. Swipe is great for board and can sometimes do double duty if it clears an Abomination or Unstable Ghoul. Starfall would also be nice, but I didn’t have one. Eventually Gothik will run out of cards and fatigue damage will kill him. I’ll try to do some more posts for beating the Heroic bosses of the Construct Quarter and Frostwyrm Lair in the future!